Their goal is to develop more reliable computer models and more accurate data for gaseous systems. According to Bross, the project is aimed at seeing how scientists can use machine-learning concepts to enable better modeling of chemical systems. The work — part of the laboratory’s strategic initiative to discover emergent phenomena and synthesize novel materials and chemical systems in materials and chemistry — is no walk in the park: Experiments that reveal thermodynamic data for solids and liquids are themselves fairly complex, but identifying data for pure gases poses its own challenges. Done well, the theoretical, mechanics-based statistical approaches that Argonne chemists use to characterize gaseous systems can produce data that are as good as, and sometimes even more reliable than, those resulting from actual experiments. 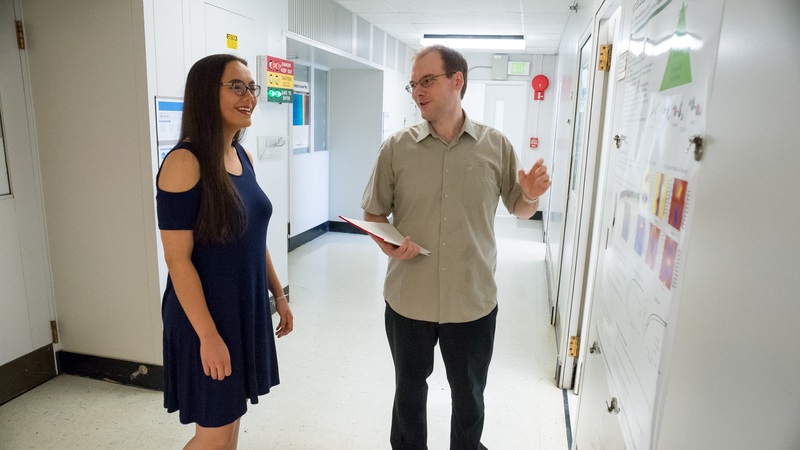 Savanna was one of more than 90 students conducting research with laboratory mentors as part of the DOE Science Undergraduate Laboratory Internship (SULI) program this past summer, said Rob Schuch, university resource developer for educational programs at Argonne. In the fall, interested students can apply to any of the DOE laboratories; researchers review the application database to identify the best matches in terms of ongoing research projects. “It’s a highly competitive process and a prestigious internship,” said Schuch. The internships give students the chance to apply their classroom learning to ​“today’s highly complex, real-world science problems,” said Meridith Bruozas, manager of educational programs at Argonne. The process is rewarding for both the student and mentor, said Bross, who enjoys sharing his work with interns. ​“You get the opportunity to showcase how you do your work to a student […] It gives us positive outreach and has an impact on the next generation of scientists,” he said. “There are also a number of benefits for students: They see the way we perform research and look at problems. If they plan to go to grad school, we have many people they can talk to who can help them choose what programs to pursue. It’s valuable from several perspectives,” he added. Working with interns involves a combination of hands-on mentoring and allowing them to learn from their own discoveries. The internships offer social, as well as academic and professional benefits for the students. Dautle said life with fellow students on Argonne’s campus provides great opportunities to bond and share experiences with like-minded peers. In her free time, Dautle hung out with her roommates and other interns from all over the country. They used the lab’s free shuttle bus to see a movie each week and another bus to visit Chicago on weekends. The SULI program is funded by DOE’s Office of Workforce Development for Teachers and Scientists in the Office of Science.